The Selection meets The Handmaid’s Tale in the epic sequel to the New York Times bestselling author Amy Ewing’s The Jewel. Violet is on the run. She’s escaped the Duchess of the Lake, who bought her at auction, and the lifetime of servitude she was once resigned to. But no matter how far Violet runs, she can’t avoid the rebellion brewing just beneath the Jewel’s glittering surface or the fact that she wants in on it. With Ash and a new ally by her side, Violet discovers her Auguries are more powerful than she could have ever imagined. But is she strong enough to rise against the Jewel and everything she has ever known? And is she willing to risk the lives of everyone she cares about to find out? Violet is on the run. After the Duchess of the Lake catches Violet with Ash, the hired companion at the Palace of the Lake, Violet has no choice but to escape the Jewel or face certain death. So along with Ash and her best friend, Raven, Violet runs away from her unbearable life of servitude. But no one said leaving the Jewel would be easy. As they make their way through the circles of the Lone City, Regimentals track their every move, and the trio barely manages to make it out unscathed and into the safe haven they were promised—a mysterious house in the Farm. But there's a rebellion brewing, and Violet has found herself in the middle of it. Alongside a new ally, Violet discovers her Auguries are much more powerful than she ever imagined. But is she strong enough to rise up against the Jewel and everything she has ever known? 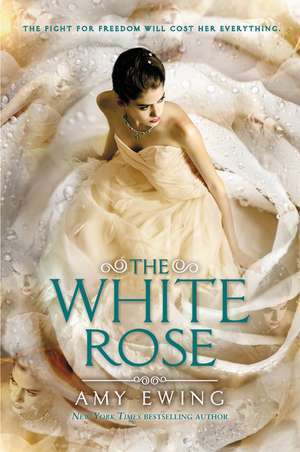 The White Rose is a raw, captivating sequel to The Jewel that fans won't be able to put down until the final shocking moments.